In the context of Onsite Product Recommendations, there might be different situations where certain global toggles should be used. These cases vary from use-case to use-case and across vertical to vertical, so instead of toggling these by default, we expose the options as manual input toggles that the end-user, together with Nosto support, can discover and utilize. 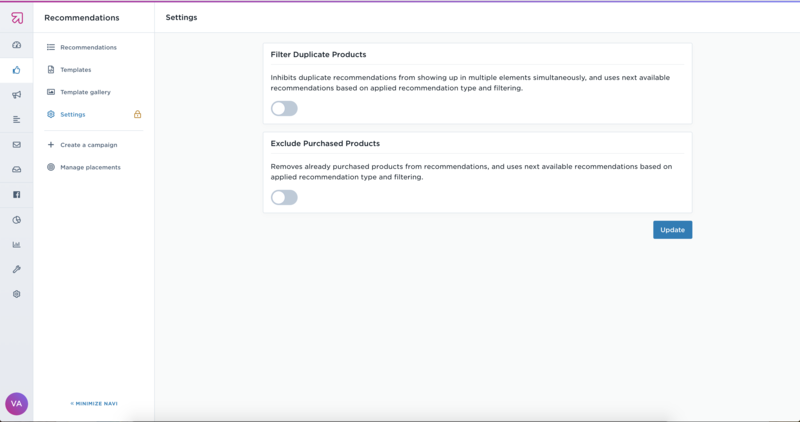 This is why, at Nosto, we combine global settings affecting Onsite Product Recommendations into one consistent location called "Onsite Product Recommendations Settings" which you can find under "Recommendations" -> "Settings" within the next layer of the navigation bar. Here you will discover global toggles affecting product and feature utilization, with a short description on what the toggle actually affects. If you are not sure if you should toggle a certain functionality or not, you can always reach out to support@nosto.com, or to your dedicated Customer Success Manager for further help. It affects product exposure if multiple recommendation elements are active on the same page. eg. If you add two or more Onsite Product Recommendation slots with a similar configuration or an identical fallback. This feature removes duplicate recommendations from showing up in multiple elements, which, for example, in the context of a product page with multiple cross-seller elements, would only show each product once. Affects product exposure based on a customer's order history, where products that the customer has already bought are programatically removed from the recommendation set. This feature is especially useful for verticals dealing in larger one-time purchases (for example: furnitures, cars, or artwork) but should be used with a certain degree of caution within verticals where customers are expected to re-purchase certain products (for example: healthcare, groceries, or cosmetics).